My cyber place motivating you to move dynamically, liberally, pain free, and happily! One of the demographic groups that can positively benefit from Yoga Tune Up® therapy ball use is the running community. It is clear to me how beneficial rolling is to this class of high impact, hard hitting, repetitive movers since I am fully appreciating great restoration from using the YTU balls on my occasional runner tissues. Short distance, competitive, and ultra runners can all gain many perks from the self-message techniques performed with the YTU balls. Heck, everyone can benefit! 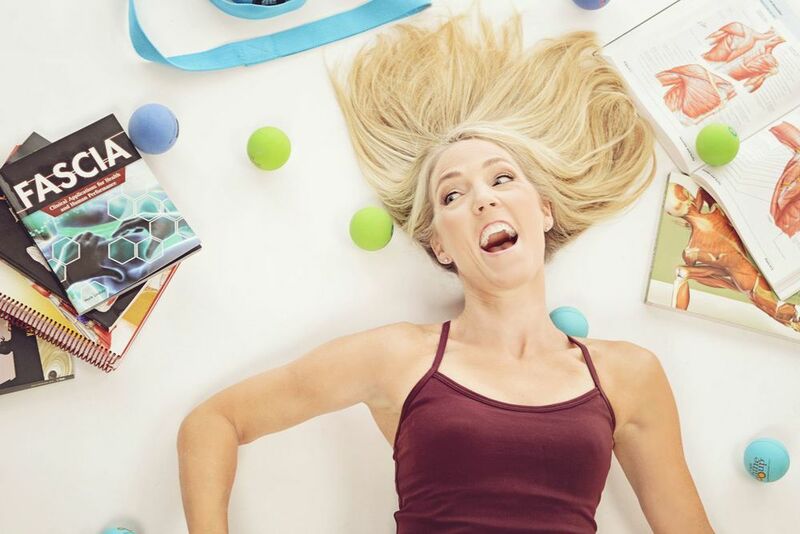 But, let’s step into how runners can uniquely use the Yoga Tune Up® therapy balls that align with particular qualities of the sport they so enjoy. The running community definitely has stretching on its radar. Calf stretch, runner’s lunge, and hamstring lengtheners all come to mind, but are those muscles really primed for stretching? After miles of a repetitive activity held in one position which draws the body forward, shortens muscles, pulls on joints, and can produce gripping and knots in many muscular areas, the balls can provide a tool for achieving some tissue balance, or homeostasis, to the body so that it is better prepared to recover. The therapy balls offer ways to roll out the knots in, and return length to, muscles so that they are primed for stretching. The YTU therapy balls create soft tissue commotion and shearing, which in turn offers myofascial release to connective fibers. This tissue friction stimulates hydration in the fascial layers and encourages release of muscular tension allowing for restoration, and supporting a return to enhanced performance. A common theme in the running world is use of the foam roller. It’s not that the foam roller is bad, per se, but the grippy, pliable, rubbery surface of the YTU balls is much more forgiving to soft tissues than a hard, unyielding foam roller. More notably, the therapy balls are far more effective at penetrating the superficial layers and “digging into” fascia. Additionally, the cumbersome mass of the foam roller doesn’t make it easy to pop in a bag for events that are traveled to, lug to parks or trails, or use during post run sessions at the computer. (Yes, you can use your therapy balls under your feet while at your standing or, eek, sitting desk!) The biggest “ah-ha” for me is rolling the IT band with the YTU balls, not a foam roller. With the small, spongy, malleable therapy balls, it is possible to get in and really cause some cross-friction and separation of connective tissue layers in the thick iliotibial band and its neighboring vastus lateralis muscle. The foam roller with its solid, inflexible surface provides more of a sledgehammer approach to self-care, as compared to the focused precision possible with the moldable YTU balls. Another terrific benefit of sharing the Yoga Tune Up® balls with runners is rolling the tissues of the upper back, shoulders and chest areas. Many runners have no idea what their favorite fitness pastime is doing to their bodies above the waist, that is, until they experience self-massage on their upper bodies. Chronically lengthened upper back muscles and internally rotated chest tissues, coupled with the repetitive pumping motion of the arms fueled by the shoulder joints, makes for a supreme slate of body parts that need to be reset, reopened and restored. The YTU balls can bring the runner greater awareness to these often unattended places and offer myofascial release to these upper body areas for soothing, self-care recovery. Check back soon for a Yoga Tune Up® therapy ball rolling exercises I most often share with the running community, the “Calf & Hammie Smash.” This YTU technique is time efficient and super effective for runners and for anyone who kneads to regain balance in tissues with issues.